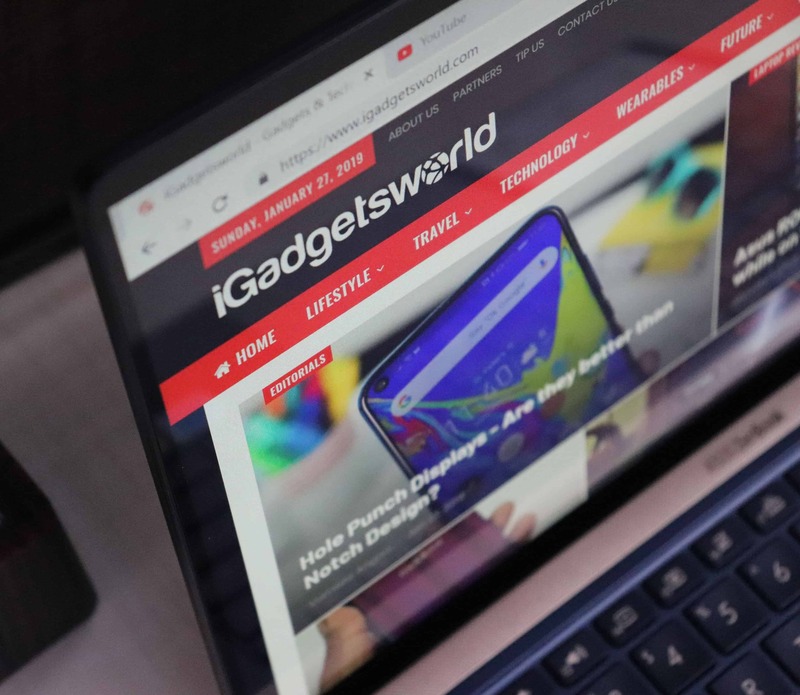 When it comes to laptop design, it has been the same over the past few years, but things have changed since the Dell XPS series launched. Majority of the brands have started focusing on reducing the bezels, and Asus is not an exception here. 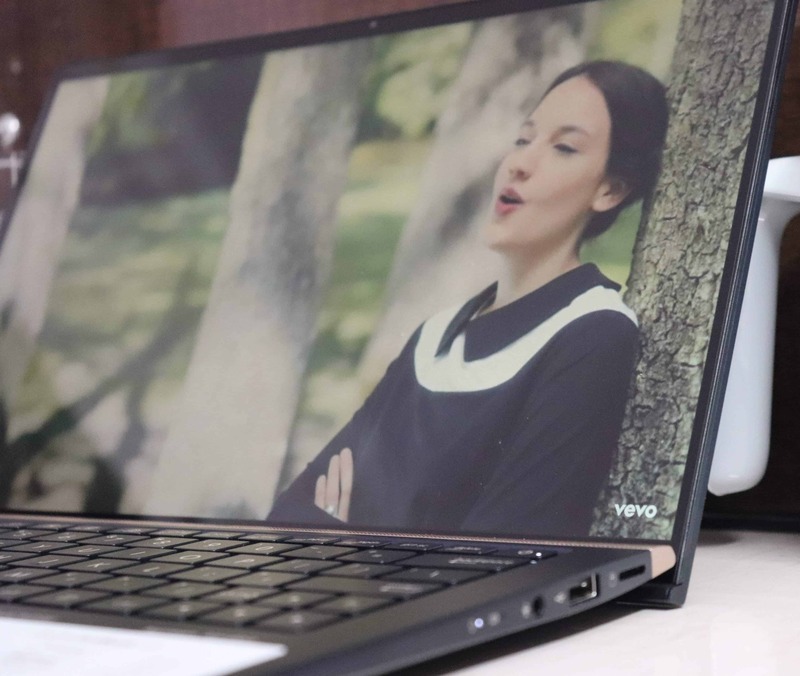 Last year at IFA 2018, Asus debuted Zenbook 13 UX333FN which is allegedly the world’s smallest 13-inch laptop. Now, the brand has officially launched it to the Indian market. There are two other variants – 14 and 15, but the eye candy is definitely the 13-inch one. Although I was a part of press briefing here in Bangalore a couple of weeks back, I received the unit [Zenbook 13 UX333FN] just last week. So, I might edit this review again to reflect my new findings. Nonetheless, let’s get started with the key specifications. Now that you’ve read the key specifications, let’s head down to the review part. As usual, the first part would be the visual part – the exterior! 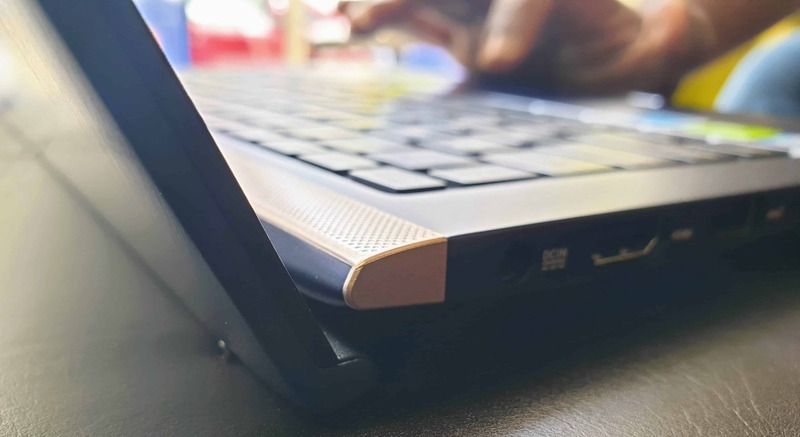 The Zenbook 13 UX333 is perfectly-balanced in terms of form factor. It’s so compact that it’s even smaller than the 13-inch MacBook Air. Even the chassis feels very light as the weight is just around 1.1KG. The Royal blue color chassis and golden ridges articulate with your personality and blends perfectly with your work desk/home desk. Opening the lid shows an FHD display and the first thing I’ve noticed is the ergo lift hinges. This design aspect meant to give you more flexibility when typing, and also aids to thermal cooling. Besides that, the 4-sided NanoEdge bezels make the display look almost bezel-less. In fact, you won’t notice the bottom bezel as of ergo lift which in the case of Dell XPS is very thick. Even with the thin bezels, there’s an IR camera at the top which works with Windows Hello for the face unlock. Of course, it also acts as a webcam for video calls, and I don’t have to stress about it. 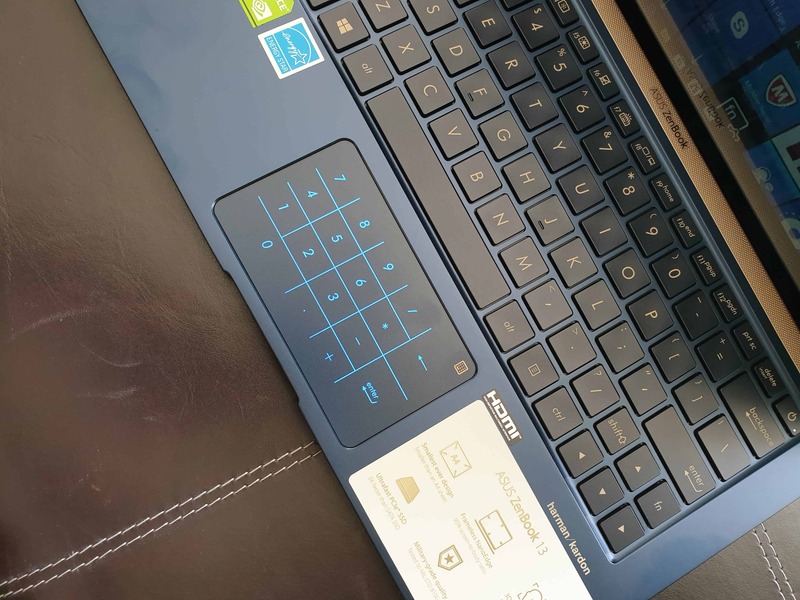 One of the major highlights of the Zenbook 13 is its NumberPad on the Touchpad which is more like ScreenPad that you’ve seen in Zenbook Pro 15. The major difference here is the NumberPad has got 2 functionalities – it can display the number pad over the touchpad and at the same time acts as a touchpad. It’s intelligent enough to discover your finger motion and acts as a trackpad, and at the same time, recognize the touch on the numbers. I’ll explain more about this in the performance part, but as of now, all I can say is it is dope. Even though it’s lightweight, portable, and very compact, there were no compromises. The best way to observe is in the keyboard layout. It has got the 1.4mm key travel giving you enough reasons to love typing. I find pretty comfortable writing editorials, and I believe you’ll love it too. In terms of build quality, the Zenbook 13 is military grade certified which means it went through several drop tests, altitude tests, etc. Personally, I’ve not tried any drop test but I’m sure it could definitely withstand as I’ve seen a demo test at the press briefing. Before I say anything, I’d like to inform you that it’s not a touch display. 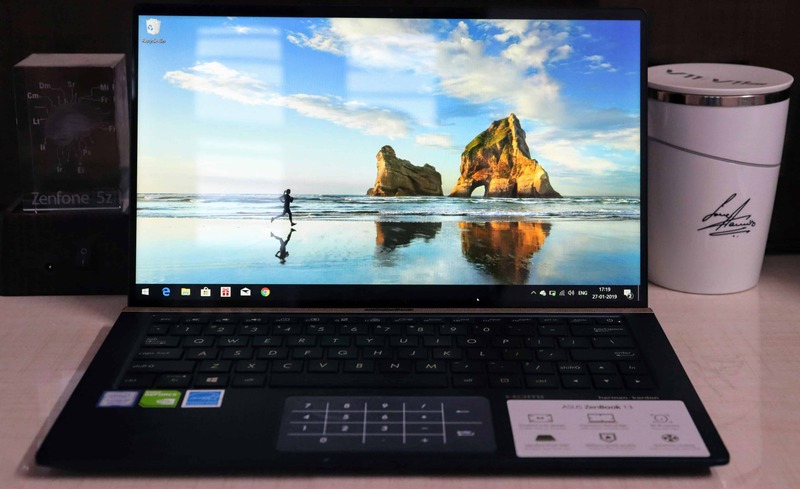 As mentioned previously about the NanoEdge bezels, there’s an almost 95% screen-to-body ratio, meaning the viewability portion is higher compared to many other laptops. But the quality matters a lot, isn’t it? I’ve seen FHD displays in other laptops where the color levels are great, and even the brightness is higher. 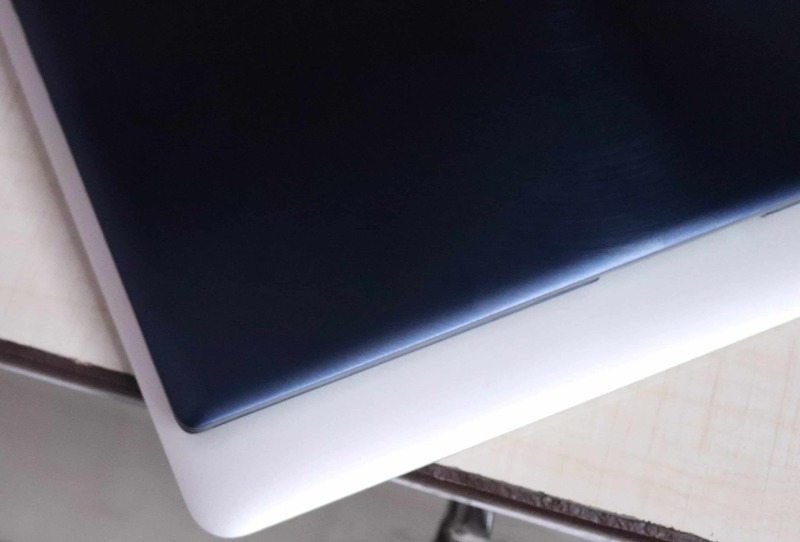 In the case of Zenbook 13, the colors look pretty dull, and even the brightness is dim [atleast for me]. I’ve increased the brightness to 100% but couldn’t notice a drastic change in the color levels. I mean, they don’t look as sharp as they should be [fewer details]. Shouldn’t I expect a little more from 1080p display? Even though I can open the lid to 143-degrees, I don’t find any practical use case as of the viewing angles. It’s quite common to notice glareness from the sideways, but here, it’s a little higher. The best part about a compact laptop is its portability. With this, there has to be a compromise in the keyboard layout, right? Many ultrabooks won’t have a number pad that you could see in a 15-inch one. 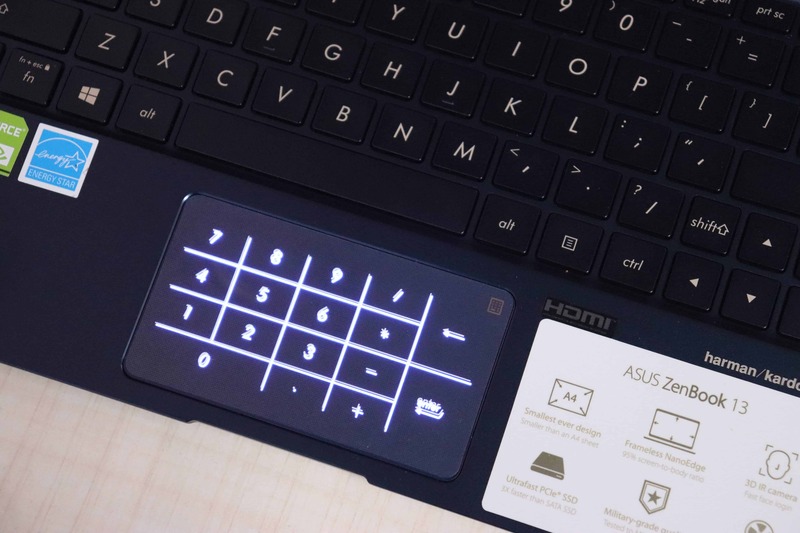 Asus found a workaround by adopting the ScreenPad tech. Let’s talk about the keyboard before we move to the NumberPad. As mentioned before, the key travel of 1.4mm is perfect for me to glide through, but the compact layout might not fit for everyone. If you’re used to typing a lot, you should definitely need to keep the laptop on a desk for a pain-free typing. I hope you understood what I mean. There’s a capacitive button on the touchpad at the extreme right side which is quite reachable with your thumb when typing. But here’s the real story – the capacitive button doesn’t have any haptic feedback, so you’ll have to keep looking at the touchpad to see if it lit up. Another thing is, the light intensity of the number pad is so much higher than the backlit keyboard. There’s no way to adjust it, and it’s quite distracting. Nonetheless, It’s intelligent enough to recognize whether I’m using the numberpad or using the trackpad. Extra brownie points for that. Anyway, only in a few cases like when using the Excel, I use the NumberPad and besides that, I wasn’t using it much. It looks like it has got all the necessary ports, but the Thunderbolt 3 is missing. Even the input port is still the traditional one where a few laptops have moved to Type-C. Anyway, it still has the HDMI port and the headphone jack. Brownie points for that. 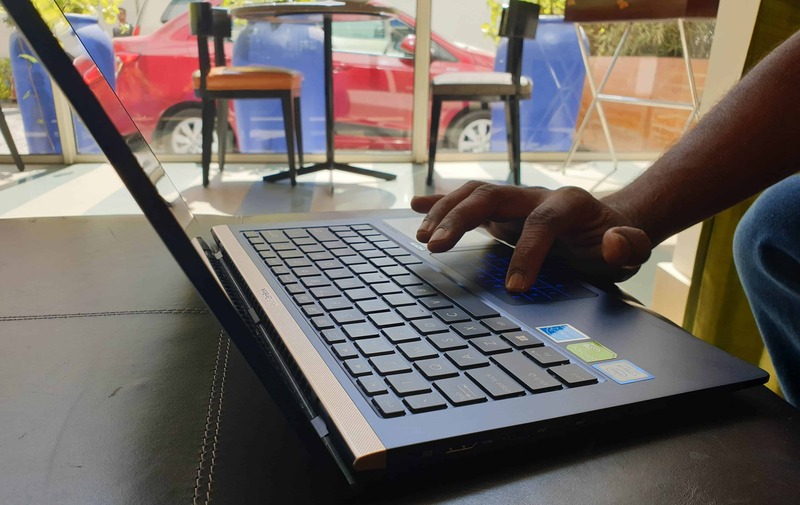 The Zenbook 13 UX333FN is powered by Intel’s i7 chipset which is coupled with a 16GB RAM. The boot time is pretty less – I mean it’s fast AF and so is the shutdown time. It’s true that OS/software also matters, but most of the part should come from the hardware too. I’m sure that you’ll be impressed [for its compactness with zero compromises] with the hardware and you can read about it in the key specifications part. For now, I’ll just give my experience using it. Let’s go deep inside [pun intended]. As you know my majority of work involves in searching, curating topics and writing about them – this makes me almost open 20-50 tabs on Chrome and Firefox, and of course along with several word documents and PDFs. With the touchpad gestures, it was like fluid moving between the applications, and honestly, there was literally no lag. There’s only one fan inside that’s keeping the CPU cool, and to the major part, it lives to its name. There wasn’t an audible noise from the fan which in other laptops, you’ll notice more, as the work I do is memory-sensitive. Maybe because of ergo lift hinges, the laptop hasn’t heated up much when doing my daily work. Just like the Zenbook Pro 15, Asus has partnered with Harman Kardon for the amazing sound quality. I’ve watched a lot of YouTube and listened to songs, and to sum it up, the sound to my ears are very soothing. I have no complaints about the sound, and yet again, with the ergo lift hinges, the sound from the bottom travels uniformly. This is an interesting part. I’ve been boasting about the compactness, but would that also true in the case of gaming? Interestingly, It’s both. The NVIDIA MX150 is not a high-end graphics card but does provide a seamless gaming experience. In my usage, there were no frame drops in the low settings, but I started noticing in mid settings. Well, it’s quite a known fact that the graphics card is an entry-level. When playing Crysis 3, I also noticed an increase in noise in the fan speed, and the bottom part heated up after some 45 minutes gameplay. Practically speaking, the Zenbook 13 could run many top games with a little compromise in the quality. Isn’t battery a major asset in the ultrabooks? Of course! Even in the case of Zenbook 13, battery life is moderate to high. The charge time is almost 2 hours, but it’s quite fast until it reaches 60%. Let me put it straight! The main reason for actually purchasing an ultrabook is because of its compactness, and ultra-portability. Most of the business people and students travel a lot, and for them, even battery life matters a lot. The Zenbook 13 has got everything you’re looking for, and at the same time, it costs you almost 1 Lakh. With a little compromise in the display quality, this is one of the best ultrabooks you could buy today. 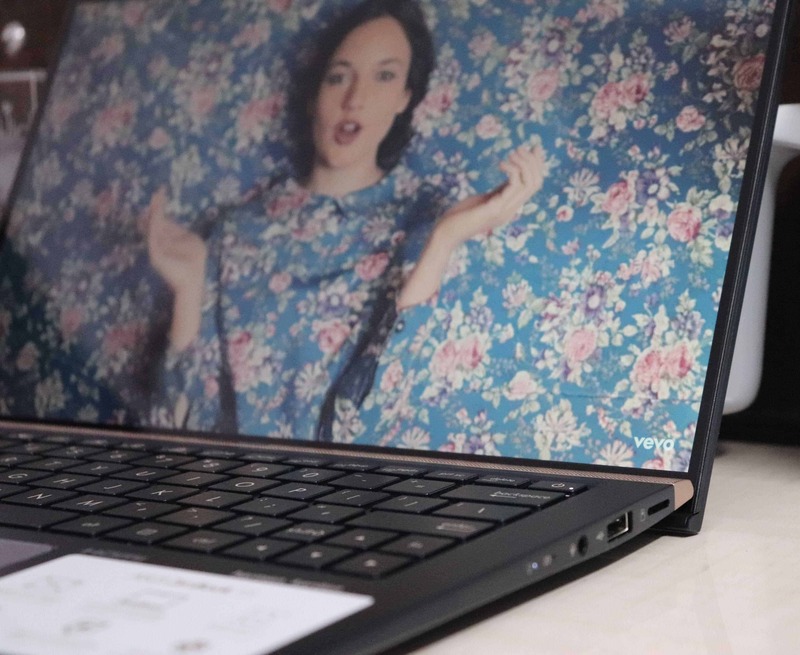 The main reason for actually purchasing an ultrabook is because of its compactness, and ultra-portability. Most of the business people and students travel a lot, and for them, even battery life matters a lot. The Zenbook 13 has got everything you're looking for, and at the same time, it costs you almost 1 Lakh. With a little compromise in the display quality, this is one of the best ultrabooks you could buy today. Previous articleHole Punch Displays – Are they better than Notch Design?